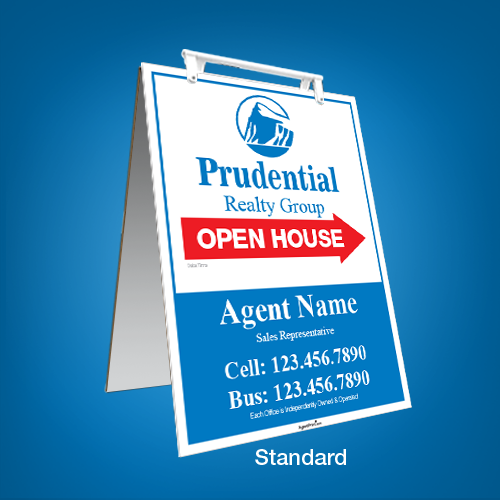 Prudential sandwich boards with write-on options help you promote your open house. Our signs are built to sustain extreme weather conditions, making them an excellent choice for front lawns, yards, garages, and sidewalks. 18"x24", 24"x32", 24"x36", 32"x36", 32"x48", 32"x48"
Contour Cut to give Rounded Corners and Shaped-Legs as shown in photo. Attention: For Rounded Corners with Feet, please leave room for the feet in your artwork. Follow the safe margin and do not put content below the line. Add Lamination for extra durability, ability to Write-On. Add Reflective option for extra visibility in night time. Partial Reflective: Reflective coating only on important information. This Includes Name, Phone numbers and Address. If more information should be included please indicate such in the additional information box on the checkout page. Fully Reflective: Reflective coating for the entire sign. NoneLiquid Lamination (Re-writable)Partially ReflectiveStandard Lamination (Re-writable)Fully Reflective + Lamin.